There are basically three types of motorcycle helmets, and they are half, three quarter and full-face. Each of these types have their own pros and cons, and the helmet you choose to wear mainly depends on your unique tastes. The question is though, should they be a requirement? Full-face helmets cover your entire head. These helmets include a visor to protect your eyes, and the inner shell is typically padded. Three quarter helmets are similar, but do not wrap around your face. Half shell helmets only cover the top of your head. While there are no visors on half shells and three quarters, you may add one if you wish. Since half helmets do not weigh much, they do not tire your neck out. It is also easier to hear while wearing them. Three quarter helmets offer much of the protection as full-face helmets do, and you can communicate easily while you are wearing them as well. Three quarter helmets also do not block your vision when you put them on or take them off. Full-face helmets offer the most protection of all, protecting most all areas of your head and face. These helmets are considered the safest type of helmet you can choose to wear. Half helmets are the least protective helmet you can wear because they do not cover much. 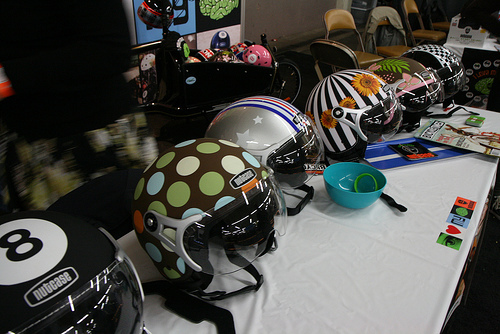 Three quarter and full-face helmets are a bit heavy, which can cause neck fatigue. Vision is also quite limited with full-face helmets, which can pose problems while riding on highways. As you can see, there are a few disadvantages to wearing motorcycle helmets. However, the advantages far outweigh the disadvantages. Now that you know the different safety options you have pertaining to motorcycle riding you are ready to buy a bike. If you are looking to keep your wallet safe as well we suggest visiting SalvageBikesAuction.com and checking out the selection of used motorcycles, like used Harleys for sale.